Over the past 20 years, I’ve had the honor of directing Ananda choirs in deeply powerful performances of Christ Lives: an Oratorio, composed by Swami Kriyananda. Just a few days ago a friend likened the experience more to a ceremony than a performance—brilliant! The practice of tea ceremony is referred to as chadō: the Way of Tea, telling us that tea is not just a drink: it’s an aesthetic, a spiritual practice, a mindset, a way of living. Tea offers a place of sanctuary from worldly concerns. 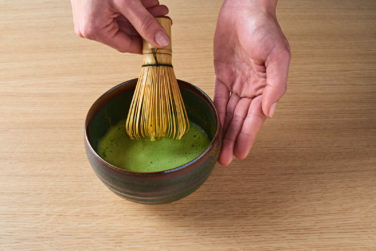 The host and guest spend time over a bowl of matcha, with the host displaying deep consideration towards the guest, who responds in gratitude. At a tea gathering, harmony plays between host and guest, guest and guest, mood, and season. Sensitivity to the changing seasons, and harmony with these changes are part of the practice of tea. Respect is extended not only to the other people with whom one interacts but also to one’s daily life, and even to inanimate objects such as tea utensils. Cleanliness and orderliness are important: entry to the teahouse is preceded by ritual cleansing at a stone basin and even cleaning floors is part of the process. A master reaches the highest level once she has put the ideals of wa, kei, and, sei into practice and begins to approach the utter stillness and silence of jaku. I deeply enjoy a Tea Master’s technique and flow. I realized likewise that in my favorite experiences as a listener, I am enjoying without comparing. The ego’s nature is to compare and judge, but the soul’s nature is to enjoy on higher than sensory levels, offered both by music and Tea. But how do we get there? How do we transform our little, comparing ego consciousness to the more expansive, responsive soul awareness? Wouldn’t it be cool if concert halls had something like the path in the Japanese Tea Garden? The experience of walking through the roji path to the tea house is meant to give a sense of traveling a considerable distance: out of the city and deep into the mountains to the hermitage. As guests walk the winding path, their cares drop away and they arrive at the tea room composed and serene. Tea gardens were historically designed as peaceful, natural spaces to detach oneself from the hectic everyday world before entering the tea house and the tranquil world of tea ceremony. But truly, our inner journey is the more important. It takes a little time, willingness, and receptivity, but it pays great dividends. Do a few rounds of even count breathing: inhale, hold, and exhale for equal counts each. Create the space around you of tranquility and stillness. Harmonize the feelings in your heart, cultivate respect and gratitude for the music, audience, and performers. Concentrate on the growing changes within you as the music begins. Honor that change.